In 2012-13 83% (5 out of 6) fire related fatalities in South Australia occurred in buildings with inoperable smoke alarms or with no smoke alarms (source: p26, 2012-13 SA Metropolitan Fire Service Annual Report). To tie in with the South Australian Fire Service “10 Years is too old” smoke alarm replacement campaign, we are offering a smoke alarm installation special. 2 x PE* 9v Battery Backup Smoke Alarm – $200 – you save $150 (regular price $350). Photoelectric* 10 Year Rechargable Battery Smoke Alarm – $117 – you save $60 (regular price $177). A hard wired alarm is connected to and powered by your mains electricity. All hard wired alarms come with a back up disposable battery providing extra assurance. * The South Australian Metropolitan Fire Service recommends all homes install hardwired, photoelectric smoke alarm systems at key locations in the home. 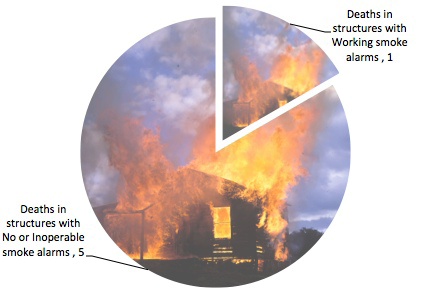 Why Install A Smoke Alarm? They save lives. A working smoke alarm can give you and your family enough time to escape. The effective life of a smoke alarm is 10 years. After that dust, dirt, corrosion and contaminants means they may not work or be inefficient. This means in the event of a fire the alarm may not go off in time or at all. Basically when your alarm is 10 years old, you don’t have a working smoke alarm.